Welcome to Carrick Court, your new home in Duncan, BC. This second floor, one bedroom, one bathroom unit is bright, clean, and modern inside. Newly painted designer colours are throughout. The unit boasts a spa-like bath with a deep tub, tile surround and lots of storage. Throughout, all fixtures are updated and modern, including the electric baseboards. The large main living space has ample room for living and dining furniture. The bedroom is a good size and has a closet organizer which increases available clothes storage space. The kitchen has a retro look with a modern sink which has a cover to increase counter space when needed. There is an extra large closet for lots of storage. The large balcony, 100 additional square feet, overlooks the back green space where you can read a book and community gardens should you wish to plant a small garden or grow your own flowers. The building is well-maintained and has renovated balconies, new windows, and new hot water tanks. The common area laundry facility has extra-large washers and has driers that dry in one cycle. 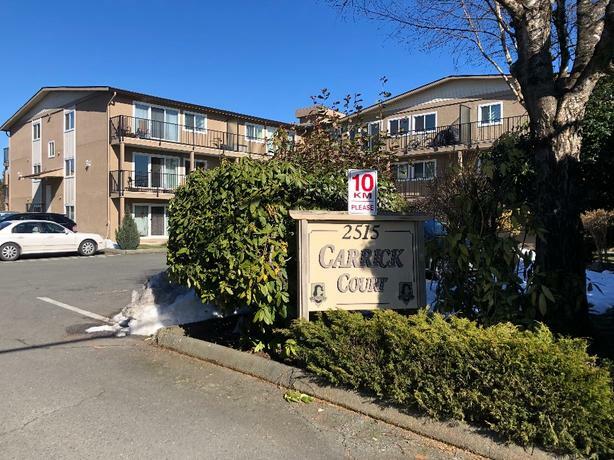 Carrick Court is within walking distance to shopping, restaurants, the community centre, the track, VIU and downtown Duncan. This home is ready to move in and quick possession is possible. contact me for more information and to view.